In the ongoing saga known as "What I'm Workin' With" we are going to talk bathrooms today, friends. Brace yourselves because it might be a bumpy ride. We have 3 1/2 bathrooms in this house (with a possibility for another bathroom in the finished basement), so while they are not in a short supply the bathrooms each need some tweaking. Come see what I'm talking about. I mean...just gorgeous, classic, timeless, and perfect. We have a half bathroom on the first floor just off of the den, which we've already found to be really convenient. It's teensy-weensy, but that means it shouldn't cost too much to spiff up, right? The wallpaper would be great pared with a solid penny round tile on the floor, which would be an inexpensive change with a big impact. From there, let's go upstairs where we have 2 more full bathrooms. Admittedly, I'm sharing these spaces today just for the sake of sharing because we don't need to use them until there are little Adams & Ashleys living upstairs. Both bathrooms have unique color schemes, that's for sure. They are both in really good condition, and I intend on keeping the original sinks, light fixtures, medicine cabinets and the tub in the green bathroom. Friends and family who have seen the house all love the cheeky wallpaper in the green bathroom, but it's aged and peeling in spots so it will probably be taken down eventually. If it hasn't already been apparent this week, we have a lot of work ahead of us. Most of these spaces haven't even been considered yet, but that's the fun in being in a home for the long term. We have 30+ years ahead of us here. If you had these bathrooms to work with, what would you do? Each day I become more jealous of this house!! Love your plans for the master and powder. And I love all the vintage originals in the two baths upstairs. I think just a few minor changes will make those original tiles sing. I have to say, apart from the master, I LOVE these bathrooms as they are! 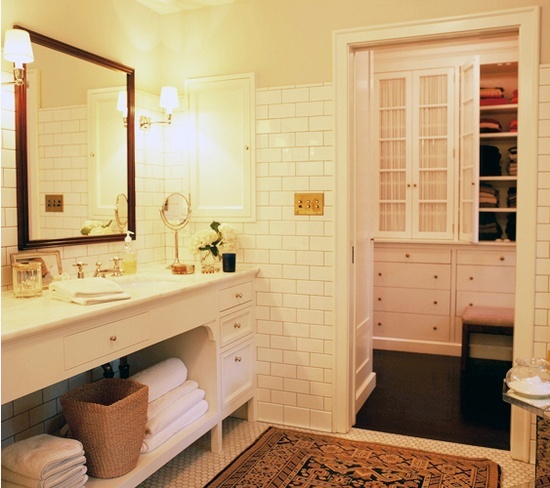 I actually love the last two bathrooms, especially the floor molding on the last one. I think for your master you could easily achieve that look on a budget. Have you looked into painting the tiles white? Painting the cabinets white and adding new hardware would be an easy fix as well. I love the floral wallpaper you've chosen, Ashley! And enjoying the dreaming stage, it's a fun part of the process! You hit the jackpot w/this house! I'm guessing since your house was build in the 50s your tiles are mud set so they won't come off the walls easily, but rather it will end up being a to-the-stud demo. 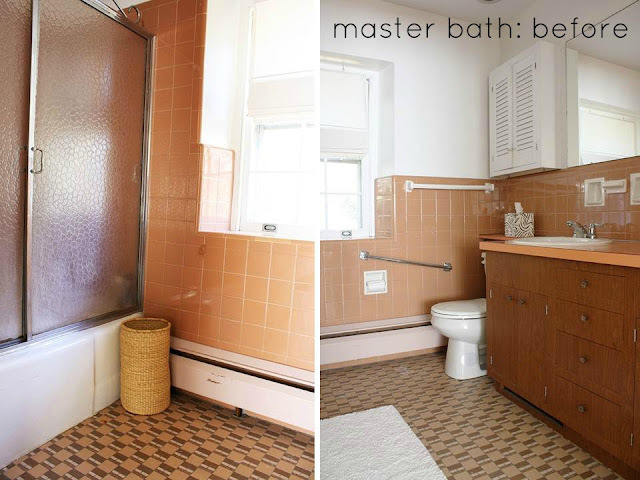 I really like the tile work in both upstairs baths - maybe just replace the floors to boost the overall look. That way you can put all your money into a complete master bath redo. My Notting Hill--I think you're totally right about the tiles being mud set. Because I haven't given the upstairs bathrooms much thought, I'm not sure what I'll want to do up there, but I probably will just end up changing out the floor tile. And HOW COOL is it that you found info on the wallpaper? Is there a way to restore it if it's all yellowed, though? I'd love to know how! I actually found some of this wallpaper, and I am the one on that site that finally got the paper I looked for, for so many years. I do know this, I have hung new Sanitas made of the same material as this one, and it is the single most durable wallpaper in the world. I scrubbed it with COMET Cleanser, and it didn't hurt it at all. Of course your paper is older, so I would just try a spot at first. However, I would bet anything that it will clean up perfect. I have even Bleached it, and it came out spotless. I'm not sure I would do that to yours, but if you intend to take it down, I would try it just to see what it does. AND if you do take it down, I will pay you for it. Honestly, I would buy it from you. That wallpaper was from the late 1950's into the mid 1960's and you have to remember that things were very different back then. That paper was so far off of life back then, it went over like crazy. It sold more than any other wallpaper had before. Back then, life was still suits, ladies that went to town with gloves, purse, a dress, heals and perfect makeup. Everything was proper, and this paper was extreme back then. Today it's just weird to many, but back then, everyone laughed, and kinda hid, making sure no one saw them laugh at it. I know we sure did. I just found your site, and I am really looking forward to see all that you do here. Thanks for listening, and blessings to all. Oh wow, you have your work cut out for you!! I can't tell you how many of these bathrooms I've seen. They were super popular in their era. I second your previous poster! 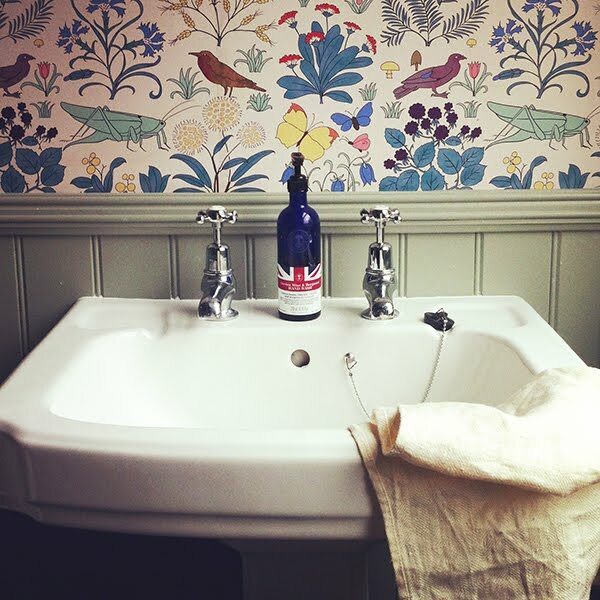 I would pay for a piece of the doodle wallpaper- I loved it for the very same reason- my Grandparents bathroom! Please let me know if you ever take the paper down. Just found your page while searching for this particular paper on Google. It was also in my Grammys bathroom and it's a found memory of her house from growing up.